I have no issue with legalising MJ in vape-liquid or edible forms. But I would prefer not to see it legal in smokable forms. We don't want to legalise another form of smoking. Interesting point. Not sure there would be a whole lot of public smoking but I'm sure that could be kept illegal. Most people who smoke dope want to do it in the company of other smokers and most would do it in private rooms or at open-air music festivals. The nature of it is such that smoking it isn't usually combined with other activities. A cross-party solution is needed to stem the synthetic cannabis crisis, acting Prime Minister Winston Peters says. Mr Peters said governments had tried and failed to address the issues around the drug and political wrangling needed to put aside. Winston Peters has told the ministers of health, justice, police and customs to put their heads together with their agencies to find the best solution to the spike in deaths from the drug. Provisional figures from the coroner show between 40 - 45 people died in the year since last June - in the previous five years there were two confirmed deaths. Winston Peters told Morning Report action must be taken urgently. 'If we missed something here, which I suspect we have, because out on the street the people we need to get to and the offenders we need to find have escaped us so let's put our heads together, analyse everything we've got and talk to people out there on the streets ... then set out to do far better than what we have been doing. Mr Peters was not sure if that meant a greater crackdown. 'We have failed to get on top of it and I hope in the next six months we will. 'It's seriously complicated - but let's not have a Remuera answer for the back street of Ōtara. Executive director of the Drug Foundation Ross Bell said his fear was that officials would look at policy responses or suggest tougher penalties - neither of which was a solution." Just had a bath, where I do my most interesting thinking. We do have a crisis, and our politicians do need to be kicked off their useless, overpaid bums. Instead of more endless debate about the risks or otherwise of doing anything at all, how about this for an interim solution? Keep the strong stuff that causes psychosis illegal for the moment, but legalise the unmutated 1960s varieties that give you a buzz without turning you into a zombie for sale only from approved State distributors. No, this won’t prevent people getting the more potent stuff and it won’t keep the kiddies safe. But it will make it much, much easier and cheaper to obtain the less harmful varieties. People being what they are, and pot smokers especially being what they are, I would bet that most will want to expend as little energy and effort as possible and will just go to the legal shops. So will those who want to experiment for the first time. Testing and checks (with severe penalties for failure) can be carried out to keep the legal shops honest. It seems even easier to import and distribute the above two, as they can be cut down so much - carfentanil is 5000 times stronger than heroin. You would need to import a kilo of carfentanil to make 5 tonnes of heroin-equivalent. We cant even manage our meth-plague properly. Smells like pork-barrelling to me. National have ignored or discounted any advice, reports, polling, etc, for the last 3 terms, and are now hopping on the "look at us - we are awesome" band wagon in an attempt to curry swinging votes. Phoeey to them, in this case .. I don't think so - or hope not - at least not as badly as it's affected the US. Apart from probably a longer "tradition" of opiate/heroin recreational abuse in the US, there are other complicating factors over there. The paid/expensive healthcare industry meant sustained pressure on Drs to prescribe drugs like Oxycontin, the maker of Oxycontin downplayed addiction risks, people got hooked, the stuff got reformulated so that it couldn't be used intravenously, so addicts turned to heroin because it was cheap and easy to get, profit for dealers could be improved by cutting heroin and boosting it back up to strength with fentanyl. As it's much stronger and the strength / purity of the fentanyl obtained illicitly varies, there's huge scope to make an error when cutting / mixing the stuff, and those errors lead to accidental OD. Extremely sad that many accidental OD deaths aren't of people who set out to abuse "recreationally", but went to a Dr genuinely needing pain relief, and got let down by a system of poorly monitored prescribing and monitoring. Isn't pork-barrel politics giving money/handouts to win votes? If you see Bridges interviewed on National's change of direction he says (paraphrased) "I am new leader and public appetite for reform has changed". Neither Labour nor National have been keen to comprehensively tackle the issue of cannabis law reform. Greens have the most thought out policy on recreational use. Nats have by far the most thorough policy (members bill) on medicinal use. Combine Nat and Green policies and there is solution. Between them, they have 64 seats - enough to pass it. It's up to 72,000 in 2017. Interesting to read about production quotas for opioids in the US. I wonder to what extent that is a contributor to the problem. Set a quota, manufacturing facilities are sized accordingly and you create an incentive for that entire quota to be sold. Let doctors control demand via sensible prescription (free form incentives and enticements) and demand may reduce to below those quota levels. I'm not sure if quotas are going to help now - perhaps the horse has bolted. 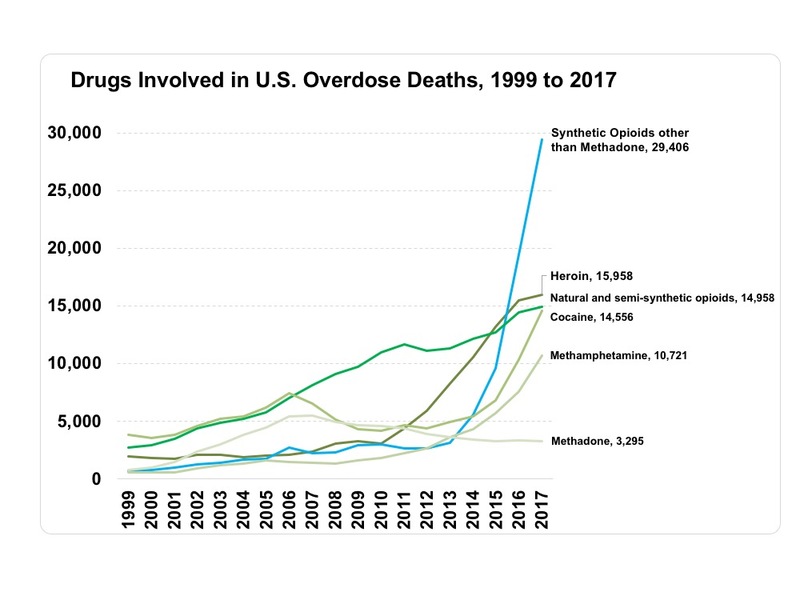 (They're looking at reducing quotas for US fentanyl production, but the stuff as discussed above is so strong that it - or other fentanyl analogues - are easily smuggled) Also while opioids are extremely dangerous - look at trends for OD deaths for cocaine and methamphetamine - far fewer deaths but the trend is much the same - so it's not just opiates - and it's not solely poor prescribing practices (you're not likely to develop a cocaine or methamphetamine habit because your doctor was an easy touch). People are voluntarily doing this to themselves. Over 12,000 deaths from "P". Gee - I wonder how that translates to numbers of persons who've got irreversible neurological damage - and also given the behavioural change and links to erratic/violent/aggressive behaviour, what the real total impact on society is. And why has methadone OD rate declined while opioid deaths have skyrocketed? I guess they'd choose the "real thing" if there was a cheap and readily available alternative choice - and if the people who needed access to a methadone program couldn't get it. "Nebraska has become the first US state to use the powerful synthetic opioid fentanyl in a lethal injection after a federal three-judge panel denied a drug company’s request to stop the execution over concerns the state had acquired the drug illegally. The execution of Carey Dean Moore marks the first execution in the state since 1997, and the use of the prescription drug in the process comes as pharmaceutical companies across the country look to take legal action against states attempting to use their products in executions. Moore had been serving prison time since 1980, when he was convicted of two first degree murders and given the death penalty. He did not file a legal challenge to the method used for the execution. In court filings challenging the use of its drugs, German pharmaceutical company Fresenius Kabi said that it does not take a position on capital punishment but that it believes the use of its product in executions could damage its “reputation, goodwill and business relationships”. Fentanyl has been front and centre for its role in America’s ongoing opioid crisis, which has led to a massive increase in overdose deaths in the past five years. Fentanyl is 50 times stronger than heroin, and has been brought illegally onto US streets as Americans battle with opioid addictions at increased rates due at least in part to the high level of opioid prescriptions. Fatal overdoses killed more than 150 people in Nebraska last year, for instance, according to the Centres for Disease Control and Prevention..."
"The National Institute of Drug Abuse estimates that up to 12 percent of patients prescribed an opioid develop an abuse disorder, and as many as 6 percent eventually switch to heroin. More than 115 people a day are now killed by opioid overdoses."